The Department for Education has launched a campaign to attract more people into the teaching profession by tapping into the emotional rewards of changing children's lives. With creative devised by Havas and PR by Kindred, the campaign, which launched this week, is based on the insight that teachers not only educate pupils but can help shape their lives throughout school and beyond. 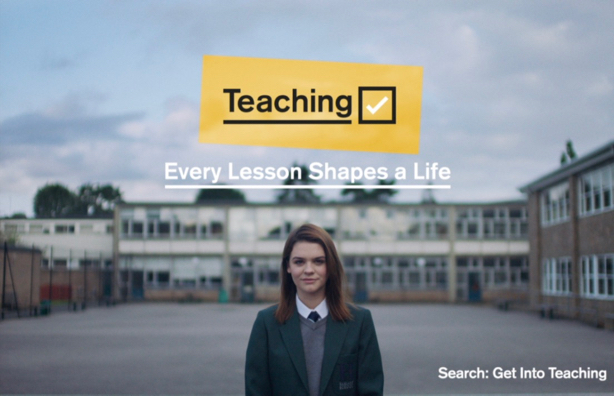 The messaging of the campaign leads with the emotional and is supported by the rational, built on the notion that "every lesson shapes a life". Themes appealing to the emotional include pride, encouragement and the idea of young people fulfilling their potential. The rational aspect of the campaign focuses on how people can pursue a career in teaching, highlighting the available practical and financial support and advice on how to apply. Activity is aimed at students, recent graduates, career-finders and those looking for a change in career, with prospective recruits directed to a campaign website where they can learn more about a teaching career. Accordingly, the channels used and the messaging will be adapted to different audiences. Activity aimed at students, recent graduates and career-finders will prioritise online media and innovative content, while career-changers will be reached through a greater emphasis on lifestyle media and how teaching can be a more deeply rewarding profession than other careers. Meanwhile, a broader swathe of PR aimed at general news, cultural and lifestyle media will ensure that the 'Get into teaching' message reaches beyond the careers and education pages of the press. PR is one element in a wider marketing campaign that includes a TV ad (above), made by creative agency Havas London. The ad, which will run on broadcast TV and video-on-demand until early summer 2019, follows the schooling journey of Abi, from her first day as a four-year-old to her last as an 18-year-old. It features a cast of real teachers. The DfE has in place an evaluation programme based on its work on teacher recruitment. It is using those insights to optimise how best to reach audience groups. Campaign effectiveness will be be gauged through a combination of the percentage-reach of the target audience, website hits and PR bursts, measuring sentiment, prominence, tone and overall campaign tracking. Kindred's client service director, Shona Mathew, said: "[Teachers'] stories and dedication to the job they do gives us meaningful content to build our creative ideas around, and then to approach media with. We are particularly excited about this new phase of the campaign, so we can build on all of our strong results to date and elevate teaching to be a career path more people choose." PRWeek reported last month that Kindred, which recently won a three-year contract to deliver PR activity for DfE, had formed a new, all-female, management team.